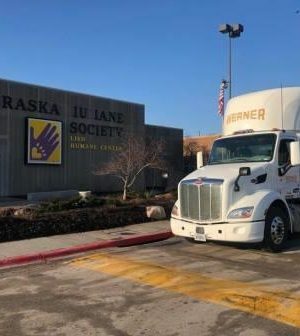 The Nebraska Humane Society has a semi trailer ready to be filled with donations for animal flood victims. It is parked outside the Nebraska Humane Society at 90th and Fort in Omaha. The trailer will be staffed from 9am-7pm on weekdays and 10am-5pm on weekends. The trailer is located on the EAST side of the building in a smaller parking lot. CAN’T MAKE IT TO THE DROP SITE?